On December 2, Gary Nunn located a male Baikal Teal at the Gilbert Water Ranch and Riparian Preserve in the metro Phoenix area - Gilbert, AZ. This news was quickly reported to many of the birding email lists and rare bird alerts, and birders from across the region have converged at GWR to catch a glimpse. 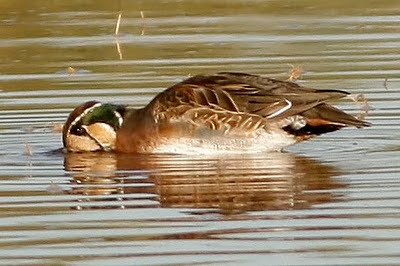 I saw the Baikal Teal this morning on Pond 6, along with a group of probably 20 - 30 other birders. 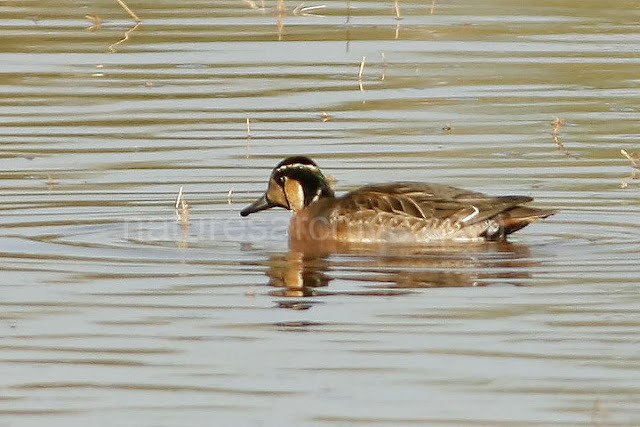 The Baikal Teal breeds in Siberia and winters in Korea, Japan, and eastern China. The bird is occasionally seen in Alaska, and a handful of records exist from British Columbia south to northern California. Inland records have usually been dismissed as escaped captive birds. Captive birds are supposed to be banded and have their hallaxes (hind toes) clipped. Photos of this bird by others have shown no banding or clipping. This does not confirm this to be a wild bird, but it helps add to the possibility that it is. The Baikal Teal was once quite common in Asia, but suffered huge population declines in the mid 1900's. It was thought to have been reduced from millions to 40,000. However, it has been enjoying a steady and rapid rebound, with an estimated population of 500,000. Along with that, it was reported that for the first time ever in 2009, two Baikal Teals were reported in Washington, perhaps adding more ammunition to the theory that this species recovery is leading to more vagrants in the USA. It will be interesting to see if this record is accepted or not. Based on past actions, many believe the record will not be accepted, despite no evidence that the bird is an escapee. Oftentimes in situations like these, it takes a second sighting in another year to prove a pattern, at which time the original record is retroactively accepted. Regardless of whether this record is accepted, just take the time to enjoy it while it stays. If you are looking for it, like other teals it is a dabbling forager, so it will often have its head submerged making it difficult to identify. While I observed it, despite there being 200+ Green-winged Teals at the GWR, this bird didn't really care or congregate with them. I heard another comment the same on Friday. It seemed to be a bit of a loaner, or perhaps more accurately a 'free spirit', only loosely associating with other ducks. It would stay put while other groups of teals would swim pasts. While I observed it, it actually remained fairly close to a loose group of Northern Pintails. Also, be sure to check out the Arizona Field Ornothologist site for many better photos and an interesting discussion of this bird. He's really awesome! I've never seen him before! Thanks for commenting - it was quite a sight for Arizona...and really for anywhere in the USA. Fingers crossed that the experts determine it to be a wild bird and not an escapee!